Sunday July 22nd 1883 I was about home all day. I slept part of the time and Vene and I were talking all the time I was awake. I took a ride with Will in the evening. Monday July 23rd 1883 I wrote a letter home this morning and went down town to mail it. I did a little trading before I came back. Laura and I went down to Bakers in the afternoon, had a pleasant visit. Tom brought us home in the buggy. I took a ride with Will later in the evening. I was thirty-two years old today. 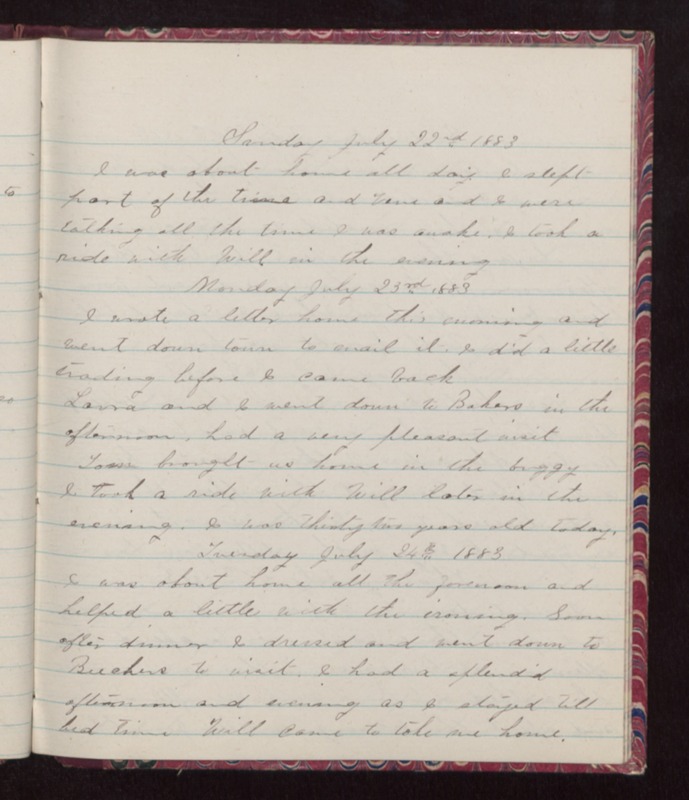 Tuesday July 24th 1883 I was about home all the forenoon and helped a little with the ironing. Soon after dinner I dressed and went down to Buchers to visit. I had a splendid afternoon and evening as I stayed till bed time. Will came to take me home.